Helpful Hearing loss and prevention links from Industrial Paramedical Services Inc.
Why you need Hearing Tests? IPS provides the below links to web sites related to hearing loss, prevention and protection techniques. We take your hearing seriously ... we hope you do too! OSHA and federal government Links to regulations on noise exposure in the workspace. Federal OSHA "Noise Exposure Standard"
Federal MSHA "Occupational Noise Exposure Standard"
http://www.audiologyawareness.com/ The Audiology Awareness Campaign is a not for profit foundation whose mission is to educate the public about the value of hearing care. The AAC is involved in a multimedia effort to help those with hearing impairment find quality hearing health care. Hear-it ...Hear-it.org deals with almost any issue concerning hearing impairment such as: good advice and practical information for hearing-impaired people -prevention of hearing loss-information and advice for relatives and colleagues -factual information about hearing issues -statistics about hearing loss -the consequences of hearing impairment for the individual as well as for society. Better Hearing Institute ...The Better Hearing Institute is a not-for-profit corporation which was created in 1973 to promote hearing healthcare across the United States. The organization is jointly funded by the manufacturers and suppliers who comprise the hearing industry in the U.S. The National Council on the Aging ...The National Council on the Aging is an American network of organizations and individuals dedicated to improving the health and independence of older persons; increasing their continuing contributions to communities, society and future generations; and building caring communities. The National Council on the Aging (http://www.ncoa.org/). American Academy of Audiology ....The American Academy of Audiology promotes quality hearing and balance care by advancing the profession of audiology through leadership, advocacy, education, public awareness and support of research. American Tinnitus Association is the national champion of tinnitus awareness, prevention, and treatment. Highly Recommended. A must-read site to find out what your rights are under this act concerning access, hearing dogs, employment rights, etc. Test your hearing and let others hear the way you do with a simulated hearing loss audio. This non-profit organization has lots of practical information for people with hearing loss. Not hearing as well as you used to? You are not alone. The number of people who probably could hear much better with a hearing aid is increasing. Baby boomers are increasingly becoming aware that they have premature hearing loss. Experts agree that noise-induced hearing loss is to blame for what 40-50 year olds aren't hearing. But, about 60 percent of those who need hearing aids go without them. Recommended health related links... QuitDay.org, who has a great page on how your body begins to heal itself after just 20 minutes of not smoking (https://quitday.org/quitting-effects/), American Lung Association, who offers a lot of help for those trying to quit smoking as well (http://lung.org/). They're both great organizations dedicated to helping people. IPS wants to prevent hearing loss in the workplace by providing professional services, products and resources that educate and motivate industrial employers and employees to support and incorporate hearing conservation practices that prevent a noise-induced hearing loss. Choose from our Single �Finger-Clip� lines, Dual Clip Double-ups, Jumbo 2x4 Series, Plastic Gripper Clasp, Hip Clip, or our Specialty Suspenders series. Try out the variety of 2 side clip �Trucker� style Hip-Clips in 1 /12" & 2" wide models. Purchase a pair of Hold-Down� Biker Stirrups or Boot Straps for only $21.95. These are the best bootstrap pant leg tie downs for motorcycle riders.. period! Choose from traditional style or Hip-Clip style super soft Under-Ups. These ultra comfortable suspenders are made to wear under loose shirts next to your skin. Enjoy shopping here for all the patented Holdup Suspender products. Call 1 800-700 4515 and ask for a full color brochure to get unique product colors and style choice search terms. Get the suspenders seen in Movies and on Movie Stars and famous celebrities for years... **Small Children's sized Holdup clip-on suspenders and Mitten and Bib clip straps... click here. Industrial Paramedical Services has been providing complete Multi-Phasic Mobile health testing services to over 800 Midwestern facilities since 1975. 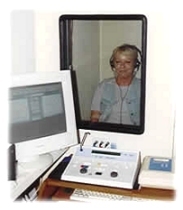 We specialize in performing on site hearing tests for your employees utilizing our copyright protected audiogram test records. Our clients include major manufacturers in the automotive, utilities, construction, petroleum, aero-space, airport workers and metal fabricating fields. Our audiometric 8 year test reports create a visual representation of hearing results that transcends language barriers and reinforces a real "fear of hearing loss" that motivates the employee to self-enforce the proper uses in wearing hearing protective devices. Early detection of hearing loss can alert both parties to the need for improving hearing protection, such as combining ear plugs with ear muffs. IPS also can furnish your company with easy to comprehend literature and videos as part of a complete health and safety education program. Copyright � 2005 Industrial Paramedical Services Inc.
All rights reserved by IPS. This includes all images and content.